Pop music impresario Simon Fuller, the man behind “American Idol” and the global “Idol” franchise, is voting to sell his mansion in L.A.’s Bel Air neighborhood. After initially listing the home in October for $37.5 million, Fuller recently dropped the price to $35 million. He and his wife, interior designer Natalie Swanston, purchased the 11,200-square-foot home in 2014 for $24 million. 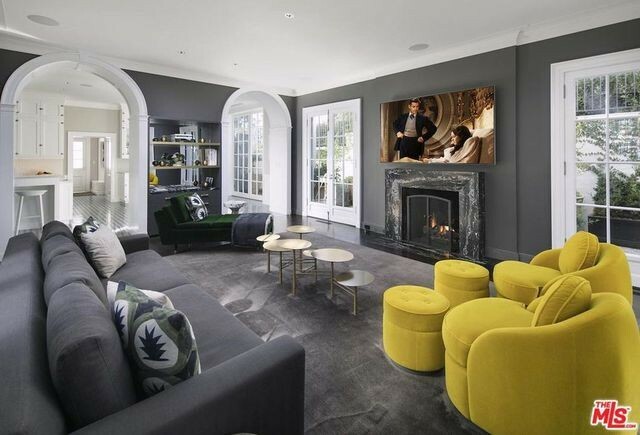 The listing came after the couple made serious upgrades to the seven-bedroom mansion. The home was built in 1927 by architect Gordon Kaufmann (who also built Beverly Hills’ famous Greystone Manor) and updates were done with a careful eye toward preserving the home’s architectural heritage. Described as an “iconic gem,” the home still maintains its original Georgian bones. However, instead of the red brick exterior it featured when Fuller bought it from billionaire David Murdock, the bricks are now painted a stately white. There are a few black accents dropped in around the home’s awnings, window panes, and front door. The red bricks were painted white. The home’s interior is almost completely done up in au courant shades of black, white, and gray—with occasional pops of color in the furniture and accessories. 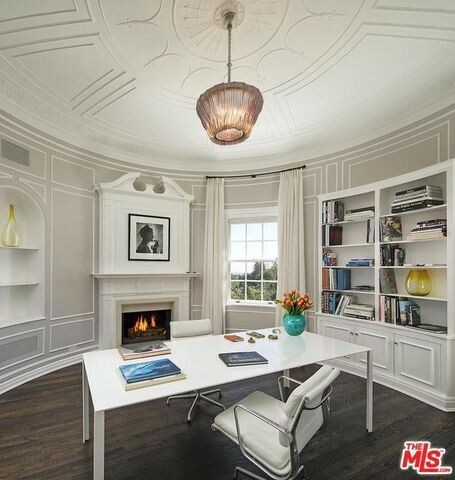 One of the features truly setting this home apart is the turret. It houses a wood-paneled library with a fireplace on the ground floor, and a circular office, also with a fireplace, above it. According to the listing, the white-on-white master suite is a “world unto itself” with a large entrance vestibule, office, gym, dual baths, and gargantuan closet. The grounds, which measure 1.6 acres, include a gated motor court, guesthouse, greenhouse, green lawns, and a pool and spa. Fuller and Murdock are not the only prominent owners of this mansion, which was known for decades as the Fredricks residence. In the 1990s, fashion designer Mossimo Giannulli and his wife, actress Lori Loughlin (“Full House”), enjoyed the views of Los Angeles to the ocean from the house on a hill. He’s diversified and global when it comes to real estate, reportedly owning homes in England, France, and Uruguay.